James Edward was the third child and second son of William Sutton and Sarah Keyworth. In the 1881 census James Edward is 18 years old and it says he is an office worker; he is still living with his family in Walkerton. Because I don't know the area and because William senior, William John and James Edward are all involved in logging in Cowichan it is difficult to get a clear picture as to who did what. However, James Edward clearly went to British Columbia at some point between 1881 and 1888 and he was involved in the logging operations in Cowichan. There is much more information about the Sutton's logging at Cowichan Bay on the web page for William senior. We do know, thanks to the extracts below, that James Edward had a sawmill at Cowichan in 1888. We also know that both James Edward and his brother, William John, are involved in robbing graves during 1888 to 1890/91 on the West Coast in British Columbia. The Suttons were clearly interested in making money, this included what we would now consider as very wrong and I want to say that it distressed me to have to admit that both William John and James Edward were involved in robbing the graves of First Nations people. For information about this we turn to Captured Heritage, The Scramble for North West Artifacts, Douglas Cole, 1985. He [Boas] dug in a burial ground near Victoria, on an island near Port Essington (while a photographer distracted the Indians), in Saanich, and, on his way home, at Lytton. He could collect only a dozen or so skulls himself, and about the same number of skeletons, but he heard of a Cowichan collection of about 75 skulls that James and William Sutton had gathered for the American phrenological market. The collection proved exciting, Boas spent an entire day measuring it, finding to his surprise considerable variation in a single linguistic group. When he received assurance from Washington that there was a market for such material, he bought the entire Sutton collection, bringing his British Columbia total to some 85 skulls and 14 complete skeletons. The Sutton brothers were willing to gather more and Boas, telling them of some sites he knew of, left an order for whatever they could find. Working both by land and sea, the Suttons gathered 48 skeletons complete with crania, one without, and 74 skulls - a total of 123 individuals in all. A recount reduced the number to 119, perhaps "a few more" than Boas had wanted, but the collection should be kept whole, the Suttons thought, "as it makes along with what you already have a complete collection from one end of the island to the other." At Boas' rate of $20 for a complete skeleton and $5 for a skull, the value of the collection was about $1,300; certainly, wrote William Sutton, it was worth at least $1,000 and he had laid out in cash about half that amount. [William J. Sutton to Boas, 15th November 1888, BBP]. The collection has cost "a great deal more trouble & expense" than Sutton anticipated. The bones were "in caves and such out of the way places" that he had had "to buy some of the indians" at a dollar each to show him the sites. That had let the word out and "some half breeds at Fort Rupert started quite a disturbance and tried to incite the Indians to shoot them." Then S.A. Spencer at Alert Bay had laid a complaint before the provincial police, causing William "quite a lively time to prevent investigation." The bones were a possible embarrassment and "I would like to get them off my hands as soon as possible." He was "afraid of the authorities confiscating them, there had been such a disturbance over them, they may be compelled to take action." The matter became even more urgent in January when the Cowichan Indians found that some of their graves had been molested and raised "quite a rumpus." Information was laid against James Sutton and a warrant obtained to search his Cowichan sawmill for the bones, but nothing was found. While the Suttons worried in British Columbia, Boas delayed in New York. He dearly wanted the bones but did not have the money. He finally made an arrangement to pay in installments, and Sutton shipped the skeletons and crania to the American museum, invoiced with a falsified origin and labelled as natural history specimens - "an incognito that answered well." There were about a dozen fewer pieces than Sutton had earlier mentioned "on account of not being able to go after some we had stowed away, owing to the rumpus with the Indians." Most came from Discovery Island, from the environs of Victoria, and from among the Cowichan in the Koksilah river area. Boas's total physical anthropology holdings thus amounted to about 200 crania, of which 100 belonged to complete skeletons. These, secured "by the help of some friends," had cost him $1,600 [ibid 23 January 1889, 22 February 1889; Boas to Horatio Hale, 2nd April 1889, draft BBP.] He quickly looked for purchasers, trying to interest, without success, the New York museum, Virchow in Berlin, and Dawson in Ottawa. In any case, he wanted to keep the collection together at least until he had finished work on it. In the meantime it was stored, first at the American museum and then, with his appointment as docent at Clerk University, at the universities laboratories. Over the next few years it grew by about another hundred, a few skulls gathered on the coast in 1889 and 1890, but most of them non North-West Coast purchases and gifts. He finally disposed of the collection, partly to Virchow's Berlin museum and the remainder, with some difficulty, to Chicago's Field Columbian Museum in 1894. In another part of his book, Cole relates the story of another collector called C.F. Newcombe who had come across an associate of Boas', A man called Sutton," who told him how, in collecting skulls for Boas, "he had always squared the chiefs of villages who told off men to accompany him & to point out those they had no objection to losing." This is in sharp contrast to the way Cole tells us another collector, George Dorsey, flagrantly pillaged many graves. There are six letters (five from William John and one from James Edward) sent to Franz Boas that are in a collection at the American Philosophical Society. I now have a copy of these but they do not add to the above. James Edward married Ada Belle Walters in San Francisco on 21st March 1891. Ada Belle was born in Kentucky in 1869. James and Ada Belle had six children: Gertrude born 1894; Edward Philbrick 1895; Fanny Pearsall, 1897; Ada Belle 1898; all born in Ucluelet; Josephine 1903; and Celina Annette 1910; both born in California. In the 1891 census James Edward and Ada Belle are in Ucluelet, James is 28 and his wife, Ada 21; he is down on the census as being a logger. Two years later, in 1893, James Edward, his brother William John and their father, William, founded Sutton Lumber Company (this was taken over in 1902, for more information see William Sutton). James and Ada Belle's first child, Gertrude, was born on 13th March 1894; she was delivered by her father! Their second child, Edward Philbrick, was born on 24th September 1895. The legal tribunals on the West Coast of Island have no plush-covered dais on which sit the leather-bound chairs of the justices, nor are there brilliant lions and unicorns painted on the walls. Court is usually held in the village store, or, failing that, the missionary house, which is usually the most pretentious in the settlement. In the matter beneath related, the accounts of which are given by passengers who arrived on Queen City yesterday morning, the village store became the court. The case was that of Dave and 15 other Indian hunters of the wrecked sealing Schooner Minnie vs the owners of the sealing Schooner Walter L Rich. The presiding justices were Messrs James E Sutton and A H Lyche. The village missionary at Ucluelet, where the trial took place, acted as counsel for the Indians, and A C Anderson, of this city, went up to represent the owner of the sealing sch. The action arises out of these facts: When Minnie went to sea last season she shipped a crew of Indian hunters at Clayoquot. The Indians were, as is customary, given advances, which were unredeemed by them in work when the Schooner was wrecked at the entrance to Unimak Pass, on her way into Behring sea. As is remembered, when Minnie was lost Walter L Rich happened along and saved her crew. The Indians were taken on board 'Rich' and spent the season on her. Captain Jacobsen went with the Indians, and the contention of the Captain of the lost Schooner was that he made arrangements with the Captain of Walter L Rich and the Indians whereby $6 per skin was to be paid to the Indians, the same being the price agreed and paid on Minnie - and Walter L Rich was to secure the advances made by Captain Jacobsen of Minnie to the Indians when settlement was made for the season's catch. If perfect amity had reigned, such might have been the case - at least so says one of the parties to the matter. After the season, according to the evidence brought before the court, the canoes of Minnie's hunters were thrown from Walter L Rich on the shore of Behring sea, the master of that vessel saying that they could not be carried during the storms then raging. Captain Jacobsen objected to this action, and there were words between the 2 masters - one witness said blows. Captain Jacobsen, the evidence stated, fought for the alleged rights of his Indians, and because of this, when the Schooner returned to port, the Indians were given papers by the master, giving a total of skins taken individually by them. There was no statement or provision in these papers regarding the advance made to them in the beginning of the season, but Captain Hahn prior to his departure made an affidavit that the said papers were given on the understanding that they were to be subject to the advances, and this affidavit was produced at the trial of the present action, which was against 'Rich' for the total amount of the catch made by the Indians at $6 per skin, and for the value of the canoes lost. Against this Captain Jacobsen claimed he was entitled to set off the advances paid, which point the defendant raised at the hearing. The presiding justices against the point advanced setting off the advances against the claims, held that they could not be so advanced, as they were practically an assignment of a seaman's wages before his engagement terminated. The plaintiffs' counsel then objected to the jurisdiction as to the canoes, on the ground that the court was only entitled to deal with the question of wages. Regarding this point a statement was made by the magistrates that they could not find any section in the act which gave them the power to deal regarding the canoes, but they said, as the Shipping Act gave them power to deal with the effects of deceased seamen, they thought inferentially that they had still more power in the matter of the effects of live men. A decision was therefore given against the defendants. 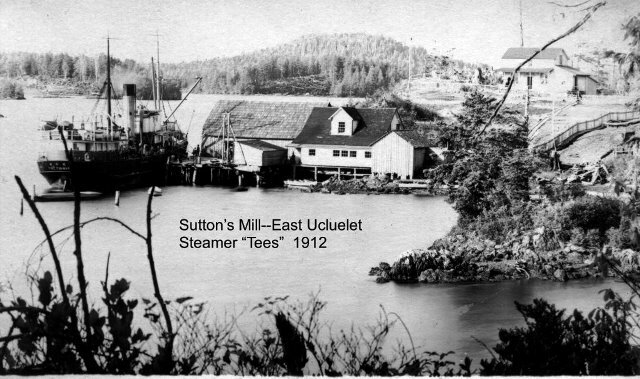 The Suttons owned a store in Ucluelet as part of Sutton Timber and Trading Company which they sold outright to James Edward in April 1896. Local historian Ken Gibson sent me a photograph which includes the Sutton Mill and store at Ucluelet. It is reproduced here with kind permission of the Ucluelet and Area History Society. Here is a link to a brief history of Ucluelet which refers to the store. It also mentions an old shingle mill owned by Mr. Sutton in Ucluelet. We learn from The Colonist, 1st January 1899, that James Edward's house in Ucluelet was burned down; the house and contents were worth $4,000. It seems it burnt down on Christmas Eve whilst James Edward was "up at Alberni. His family were asleep in the house when the blaze first started, but were fortunately warned in sufficient time to avoid danger. The house, with its furnishings, was totally destroyed, and as there was no insurance the loss comes particularly heavy on Mr Sutton." The same newspaper tells us that the house was rebuilt later that year. James Edward was heavily involved in the Wreck Bay gold mining enterprise. The Wreck Bay (now Florencia Bay) beach placers occur between Kennedy Lake and the west coast of Vancouver Island. The placers extend from Ucluelet to Tofino Inlet on a flat coastal plain composed of unconsolidated sands, fine gravels and thin beds of blue clay. These Pleistocene sediments contain a small amount of black sand (magnetite) and fine gold which is being continually concentrated at the base of the cliffs along the bay. Prospectors and campers have historically panned the sand periodically. The amount of sand is small and the quantity of gold is very small where concentration due to wave action has not taken place. The gold probably comes from the quartz veins that occur to the west of Kennedy Lake. In 1900, 23,996 grams of gold are reported to have been removed from these sands (Annual Report 1900 p. 924). The deposit appears to have been mined out between 1899-1902. The discovery was made by Charles C. Binns in 1898. I have found a wonderful photograph of James with Charlie Binns panning for gold, it is in the book Long Beach Wild: A Celebration of People and Place on Canada's Rugged Western Shore by Adrienne Mason. I have sent off for a copy of the book to trace the photograph and hope to be able to acquire a copy. James Edward was very much involved from the beginning; there are many references in The Colonist to James Edward and his colleagues, staking their claims, bringing in special machinery to help sort out the gold from the black sand and noting the amounts of gold found. James Sutton of Ucluelet was one of the very first to give attention to the now famous gold-sand deposits at Wreck bay, came in by Queen City yesterday, with the object of consulting the minister of mines in behalf of himself and those interested with him in the Wreck bay claims - as to the condition of their lease. Nothing further has been done on the ground since the visit of the Colonist's special representative, although Mr A M Cross' tubular amalgamator was taken to the scene by Messrs Eby and Rideout, set up, and started. It proved so faulty in construction that it would not lift 2 - to say nothing of the required 10 lbs of quicksilver, and also leaked and otherwise failed to accomplish its mission. For this reason the 2 gentlemen are resting on their oars at Ucluelet, having sent for Mr Cross, the inventor, and his larger and more perfect machine. Another 'man with a method' was on the beach recently, with a copper-plate gold-saver, which succeeded somewhat better than the tubular amalgamator; he found the gold to be present in quite sufficient quantity to pay handsomely, and was extremely disappointed that he could not secure the right to work the claims applied for, on a liberally lay. Still another gentleman who is anxious to make a fortune from the Wreck bay gold, as the representative of San Francisco capitalists is now on his way to the scene of Mr Binns's discovery, on the specially chartered Steamer Willie, with which he has been having a look in passing at the Granite Creek deposits. These are very similar to the sands at Wreck bay, and were for many years worked both by white men and Chinese by the ordinary process of rocking - boulders finally putting an end to operations. The entire extent of the ground showing good colors at Wreck bay has now been taken possession of, and while the claim-holders do not imagine for a moment that they have an El Dorado as a placer proposition, they are nevertheless sanguine that it will prove a money-winner when worked by the propery scientific system. When Willapa returned from her long trip several days ago news was given that in the safe of Messrs Sutton and Graham, who are working the Wreck Bay placer mines, there was about $400, the clean-up of the black sand properties. Willapa, when she returned from the Coast yesterday brought down this gold, which is the 1st shipment to come from the placer mines of the Coast. These mines, which were discovered about a year ago, it was about the end of May last year, although nothing was given out about the discovery until the beginning of July, will soon be very rich producers, according to the belief of those who have visited them. The gold was taken from the mines under conditions which were not conducive to fast work, the sands being washed in the crudest of rockers and with a very sparse supply of water for washing purposes. The scarcity of water has been the greatest drawback to development, but now this is to be overcome, and there is more machinery to be put in which will greatly increase the output of the property. H Burnett, returned by Willapa from the mines after making a survey for the flume to be built to bring water to the workings which will involve the building of at least a mile, if not more, of flume. Tenders will probably be called for at once for the building of this improvement to the mines. The building of this flume will involve an expenditure of about $3,000. When the Wreck Bay mines were first discovered by Mr Binns, who afterwards in company with many of the other holders of the property sold out their interests to Mr Sutton, the Colonist sent a member of the staff to the scene of the discovery, and he fully described the discovery. When Willapa, which returned from Ahousett and way ports on the West Coast yesterday afternoon, returns from her next trip to the coast, she will bring down a further consignment of treasure from the Wreck Bay black sand placer mine, which promises to turn out a Goiconda. According to advice brought by the ship yesterday afternoon, the little gold washing machine, badly fed owning to the poor facilities at present for bringing water to the mines which Messrs Sutton and Graham have been working on the mounds of black sand has, with its 2" stream of water washed out no less than $1,000 in golden dust. This $1,000 worth of precious metal - the 2nd shipment from these nearby mines - is to come to this city on the next trip of Willapa. The work on the flume, which is being constructed to carry the water so urgently needed to work the mines, is being rapidly advanced, according to the report received by the west coaster. The workmen had laid about 35,000' of lumber in the flume and more lumber is to be taken to them on Steamer this trip. There was no less than 25 men at work on the property when Willapa was there. Willapa on her arrival from West Coast yesterday afternoon brought a consignment of treasure. She had onboard about $900 in gold from the Wreck Bay mine near Ucluelet. This shipment is the forerunner of many others, much larger, it is expected, that will soon begin to come from there. It was washed from the black sand by a small gold saving machine, which throws only a 2" stream. When the flume, which is now nearing completion, is ready it will bring the much needed water from a distance of about 1 1/4 miles to operate some hydraulicking machinery that is being put in by those working the mine. The black sand placers at Wreck Bay were discovered in May last year, but nothing was known of them in Victoria until about a month later, when the news of the find leaked out. 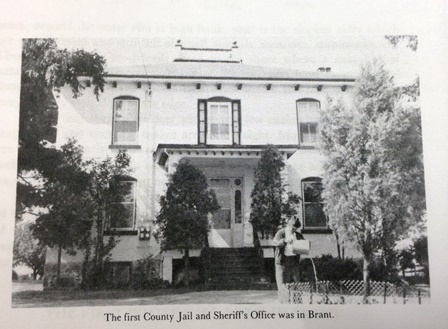 The officers of Willapa were among the first to stake properties and they had Willapa group. Since then some had sold out, but still some of Willapa's company hold no small interest. The find was made by C C Binns. He and many of the other locators, after working independently for some time, pooled their interests and arrangements were made with Messrs Graham and Sutton to work the properties, they to receive 65% of the proceeds for working the mines. Until recently they worked only with rockers and with a small gold-saving machine, but being confident that big returns will be given by the area of black sand, arrangements were made for the construction of a long flume to carry water to the property - the scarcity of water had been one of the greatest drawbacks to the work - and machines to more extensively work the mines are to be put in. The $900 brought down yesterday is not the first shipment from the mine, for several others have previously been sent down. This is the largest, though, yet received. When Willapa returned to port yesterday afternoon after her trip to Cap Scott and way ports on West Coast, she brought news that the black sand placer mines of Wreck Bay are yielding even richer returns than hoped for. J E Sutton, who with Mr Graham is working the small gold saving machine on the beach took out as much as $120 on Thurs last. The output of the black sand shovelled on to his gold-saving plates during the morning of Thurs last amounted to $20, and in the afternoon the yield went as high as $100. So rich is the bedrock on the beach in places that the miners have taken out within the past few days as much as from $1 to $3 to the pan. The rich finds being made on the beaches of the West Coast bay, as can be expected, are causing no end of excitement at Ucluelet, and the miners who are washing the sands there are growing in numbers. When Willapa left there were about 35 men working for the Graham-Sutton combination and about 15 or more who have gone over from Ucluelet to work independently. C C Binns, who discovered the property about 18 months ago, is working a machine on his own account and reports that he is doing very well. The majority of the others are washing the sand in prospecting pans. But a percentage of those employed at the bay though are engaged in washing the sands, many are at work completing the flume which is to carry water to work the hydraulicking machines to be put in as their work is complete. With the returns given in the working of the small machines and the pans, the miners reason that very rich results will be obtained when the flume is completed and the larger machines are at work, and it is expected that much gold will be shipped to Victoria on every trip of Willapa. The beach on which are the black sands which are producing the golden returns is about 8 miles from Ucluelet Post Office over the trail and about 10 or 11 miles by sea. The paystrike runs along the beach up into the Indian reservation at the end. There are 9 claims, each of 500 yds in size. At the back of the golden beaches are some cliffs, whence the miners believe the gold taken from the black sand came. Colors have been found as well on the Indian reservation, but no work has been done there. Willapa landed the last consignment of lumber for the long flume which is to carry water for a distance of over 1 ? miles and do away with one of the drawbacks of working the mines, and about 2 weeks hence the flume is expected to be completed. Then hydraulic plants will be put in by Messrs Sutton and Graham, who are working the greater portion of the beach for the various owners at a percentage, and a much larger yield is expected to be taken out. It is thought that Willapa will have gold on nearly all of her trips from the mines. That the yield will be very much greater when the new apparatus is put in is easily to be seen when it is stated that the little stream of water thrown by the little machine which has been in operation at the mines is not large enough to wash one shovel of dirt at a time. According to one of those who has worked at the Wreck Bay placers, there are 2 paystreaks there. At a depth of about 6" below the surface shingle there is one strata of gravel which carries gold, and below this there is another gold-bearing strata of gravel separated from the first paystreak by a layer of gold bearing sand extends to bedrock. On Thurs last the workmen had been working all day with little result, and were about putting the day on record as a poor one, when in less than an hour that evening as much as $50 was taken out. This however was not the usual luck. It established the record at the mines. The process used in working the black sand placers at the bay is thus described by those on the Steamer who have been present during mining operations: The sand is shovelled into a sluice and carried down to a 23" mercury-covered plate, by slow degrees. Between the plate and the sluice-bottom is a thin layer of netting which catches all the coarser sand. The scant supply of water, though, greatly inconveniences and delays the work. However, it is only for about 2 weeks or thereabouts that the crude method is to continue in vogue, for thereafter the flume will be used to convey a large body of water to no less than a dozen machines, and instead of the smaller 12" plates, plates of 20" will be used in the gold-saving machines. All expect that considerable gold will be taken out from the black sand before the beach is worked out. There are now about 40 men engaged there, mostly working for Messrs Sutton and Graham, who took over the working of the majority of the claims on the basis of receiving 65% of the earnings for working the properties. There are, though, several who are working claims independently, among these being C C Binns, the discoverer of the mines, and Campbell, of Clayoquot, both of whose properties are turning out well. The mines are not many miles from Ucluelet, but the trail is so bad that considerable time is taken to reach them from the West Coast port. The trail is expected to be improved before long. Willapa has been landing the goods for the miners in Wreck Bay, instead of at Ucluelet, as was at first done. At the rich mines at Wreck Bay there was an animated scene when Willapa was there. The long flume which carries water to the workings for about 1 ? mile along the beach, is to be extended, according to one of the workers there, for at least another mile. The new machine which had been installed had not started operation when Willapa sailed, but it was expected to begin within a few days after her departure. A number of large amalgam plates were taken up for it on the last trip of the coasting Steamer. The new gold-saving machine, which will be operated with the smaller ones, which have already - according to the statement made by Mr Sutton to a late arrival from Ucluelet - taken out $8,000, will wash 3 times as much sand as the smaller machines. There are about 30 men at work taking treasure from the black sands at Wreck Bay, and before long, it is expected that at least double, if not treble that force will be employed. Mr Sutton, the manager of the larger block of claims being worked, is now looking for more miners. Willapa brought no gold from the mines on this trip, but it is not unlikely that she will have a consignment on her next trip down. She leaves tomorrow and is due back on Friday. While much ... is being taken from the black sand, much is being expended there for apparatus and equipment. There are now 3 gold-saving machines and these, with the building of the lengthy flume, have cost the operators no small portion of the earnings to date. With the plant installed though, they now look to take much more from the mines. The black sand properties at Wreck Bay were discovered about two years ago by C C Binns, who was a passenger down from the mines by Willapa yesterday. He was the 1st to stake a claim there. There followed some settlers from Ucluelet, among them Mr Sutton, the present manager of many of the claims, and afterwards some of the officers and crew of Willapa secured claims there. They named their claims Willapa group. C H Gibbons, then of the Colonist staff, went up in July last year, to investigate the richness of the mines, and he also staked a claim. He afterwards disposed of his claim for a song, and several months afterwards watched it change hands for $800. Some of the officers of Willapa too, had not sufficient faith in the mines at that time, and they - although they afterwards regretted it - sold out their interests. Later, arrangements were made with Messrs Sutton and Graham, the latter a San Francisco mining man, to take over the working of the greater portion of the claims, the operators to receive 65% of the profits for working the mines. The investment has been a very profitable one. A gentleman who has just arrived from the West Coast states that the Wreck Bay placer mines, operated by the Ucluelet Placer Mining Co Ltd, are going to be a great success. Much gold is being taken out, a lot of the ground going as high as $2 to the pan, while that portion lying nearer the water dwindles down to 40 cents to the yard. The new flume, capable of carrying 600" of water, if necessary, is 1 3/4 miles long, and considering the difficulties to be overcome, has been constructed in very good time. Mr H Burnett, of the firm of Gore & Burnett, was the Engineer in charge, while W E Losee with his crew of 30 men completed the whole work in 12 weeks, including the landing of all the lumber and supplies. 45,000' of hewn timber and posts for trestle work were got out on the ground; and 2 bridges, one 80' in length and the other 150' in length, across Lost Shoe Creek, one mile up stream from its junction with the sea. The flume has a fall of 1/10' in 100; one of the trestles is 40' long and 18' high; another trestle is 900' long. Three new machines, 20" wide by 12" long, were also constructed. They are all of the amalgamator type and capable of handling 25 yards of sand each every 10 hours, with the labor of 2 men to a machine, which is made after a design of Mr T Graham, who is Superintendent and part owner of the property, and being a thorough and practical mining man, the workings could not be placed in better hands, especially combined with the ability of Mr J E Sutton, of Ucluelet, who is the manager for the company. It will not be long until the output of the workings will surprise some of the would-be experts who pronounced the beach not good. Including buildings, flume, dam, etc, the company have expended nearly $10,000 in getting the property into working shape, and there is no question but that they will be considerably better off in this world's goods by the time they have their 2 ? miles of beach worked out. Now in the city, was one of the first miners to get in at Long Beach, and 20 more miners soon followed his example and put up their location stakes. J E Sutton, of the Wreck Bay mines, is also interested. He has been in the city for some time and will leave during the month for Wreck Bay, where work, which has been suspended on account of the high tides of the winter, will be resumed on Apr 1, and with the development of this rich beach together with the work on the newly discovered one nearby, there will be a busy time in the vicinity of Ucluelet this coming summer. Long Beach will be worked with machines, as is that of Wreck Bay, and some gold saving machines are expected to be taken up shortly by West Coast Steamer. Queen City sailed for West Coast on Sun night. She had among her passengers C C Binns, and J E Sutton for Wreck Bay, the latter being in charge of the gold saving operations there. He will resume work with the 4 machines in the beaches there at the beginning of Apr. Mr Binns took up lumber for a new store which he and Mr Anderson will establish at Ucluelet. C C Binns, who was a passenger to Wreck Bay on Queen City, and who was the discoverer of the rich black sand property on the Coast, says that Mr Sutton and the others interested in the company which is working the beach at Wreck Bay, expect to take out at least $150,000 this coming season. Work has already been commenced at the rich mines, 2 machines having been put in operation. Mr Sutton, who is now in Victoria, will leave for Wreck Bay by the next Steamer, and the other 2 machines will then be put in operation. After the first week in Apr the machines will be increased, 6 more being taken up on Queen City, making a total of 10 to be used during this coming season. Last year the workers took out $12,000 from a narrow deposit of black sand, about 15' wide and 150' long, working with small plates 12" long and using a stream of water of ?". Now, with the flume afterwards built and 10 machines with plates 3' across in each, they expect to take out at least $150,000. Whether Long Beach, which has since been staked above Wreck Bay, will turn out as rich, is yet to be seen. Among her passengers was W J Sutton of the Wreck Bay Mining company, who has been here making arrangements for the introduction of a retort and furnaces at the black sand mines. This new addition to the plant is to be established in the immediate future, and after the next shipment of gold has been sent down by Queen City in dust as heretofore, the shipments will be made thereafter in gold bars, each bar being assayed at the mines, and its weight and value stamped on every bar. It is the intention of Mr Sutton and his associates also to install an assay office at Wreck Bay. W D Snyder, one of those who recently passed the provincial examinations with honours, has been selected as the assayer and he will leave for Wreck Bay probably on the next trip of Queen City. This will be the first assay office established on the coast, and not only will the black sand of Wreck Bay be assayed and treated, but all ores, sand and quartz brought to the assayer. The 1901 census has James Edward, identified as 'a spiritualist' is 38, his wife Ada is 31. Gertrude is 7 and Edward 5; the family now includes Fanny, 5 and Ada Belle, 2. They are living at Alberni. James is down as a lumberman. Queen City had a number of passengers, among them being W J Sutton, of Wreck Bay, and Messrs Riffenburg and Dr Gunn, 2 San Francisco capitalists, who were arranging for the purchase of the Wreck Bay Co property at the West Coast mining point. The San Francisco men have brought down half a ton of black sand from the mines, and will run a mill test here today. We know that in 1903 James Edward and his family have moved to California as their next child, Josephine, is born there that year. By 1910 James Edward, who is down on the census as a civil engineer, and his family had moved to Alameda, California. and were living at 2142 Clinton Ave., Alameda Ward 3, Alameda, California. Their sixth child, Celina Annette, was born the same year. In 1920 they are still living in Alameda. Interestingly, it says they are renting the house they live in and they have a Danish boarder, Carl Olsen who, like James Edward, is down as a car mechanic. All of their children are still at home except Gertrude. Their son, Edward Philbrick, is also a mechanic. None of the girls appear to have an occupation. By 1930 James and Belle had moved to Redwood, Santa Clara, California. James is retired. The census tells us that their house is worth $30,00 and they have a radio! Also living with them is their five-year old grandson, William Mackay, and Belle's brother, Benjamin W. Walters who is 65 and working as a clerk in a cigar store. James Edward died on 17th October 1935 in Oakland, California at the age of 72 years. Ada Belle dies on 29th November 1946. Gertrude married George Scott Ensminger in 1917. They had two children, Shirley Rae (1918-1995) and Beverley Jean (1923-1987). I can't find out much about Edward Filibrick (or Philbrick). In 1922 he was a sign writer and lived with his parents at 2059 Alameda Avenue. He died on 23rd July 1966; his last residence was 94112 San Francisco. In 1920 Fanny was living with her parents in Alameda. She is 22 and is married, although her husband is not with her, to someone called Baldwin. At some point her husband died or they got divorced because when Fanny died she was called Marx, she died on 15th September 1944. Adabelle went to Alameda High School and we know, from the High School records, that in 1915 she was going to the Feather River region for her summer holidays. Adabelle married Archibald Eaton Mackey in 1918. 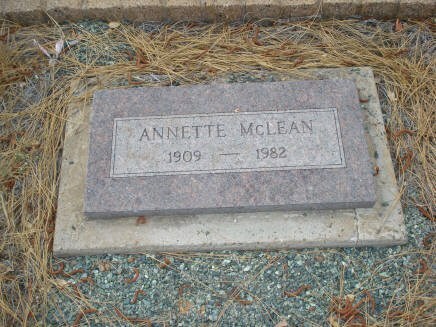 She was living with her parents in 1920. I believe they had two children that I know of, Margaret Belle (1920-1987) and Laura May (1922-1989). At some point either her first husband died or they were divorced because when Adabelle died her surname was Dohle. Josephine married James Solomon on 8th April 1922 in Alameda. James was a stock manager for a pine company. His mother's maiden name was Anna Patoskay, and was born in Germany; his father was John Solomon and was born in Austria. I don't know if they had any children. She died on 4th October 1980.